The University of Namibia recognises the power of education to support individual and community development. Working towards its vision ‘to be a beacon of excellence in teaching, research and extension services’ UNAM launched its Diploma in Higher Education (similar to PgCUTL) in March 2016 with a cohort of academic and learning support staff in the Faculty of Health Sciences. The DHE is constructed as a series of standalone modules in which participants apply theory into owned practice through module-specific tasks, and a threading portfolio that enables participants to evidence their cross-module learning. We are privileged that Cardiff University, through the Phoenix Project, has been able to support UNAM’s request to set up a co-mentoring scheme for the DHE. 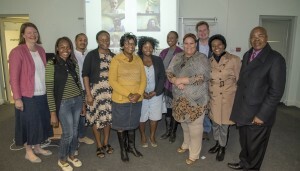 Our recent visit to UNAM brought the Programme Senior Team: Dr John Nyambe, Dr Kavena Shalyefu and Professor Tim Rennie, DHE Tutors, Participants and Mentors from UNAM and Cardiff together physically and virtually to explore the mentoring approach that suited the needs of the DHE and its participants. In an intensive week of meetings, workshops on reflective practice and peer observation of teaching and learning, guidance writing, video scripting and recording, and designing, developing and testing a Moodle and Mahara platform area to support distance-collaborative mentoring, we formed a close group in which the needs, concerns and sheer excitement of learning in a cross-continent triad informed the Scheme. 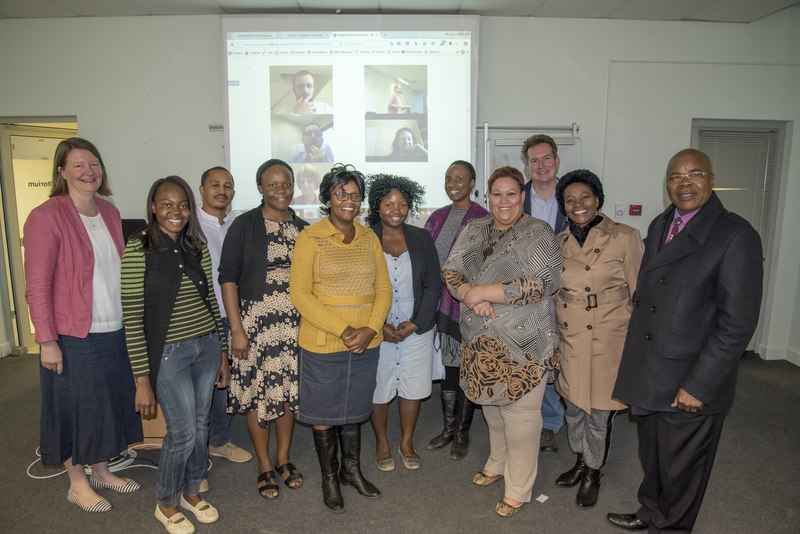 The DHE Co-Mentoring Scheme was formally launched at an event on the last day of our visit, supported virtually by Cardiff University DHE mentors, and locally by senior UNAM colleagues, participants, UNAM DHE mentors and tutors. In her participant-response during the event Radiography Lecturer Caroline Nabasenja described the opportunities she saw arising from the co-mentoring scheme including the chance to share teaching/ learning experiences and challenges with discipline-similar, but culturally and geographically diverse mentors, and the potential to build a shared sense of curiosity for education from which future scholarship projects may emerge. Evidencing the way that this collaboration models the Phoenix Project’s ethos of ‘mutual capacity strengthening’, respondents from Cardiff spoke of the opportunities to learn from UNAM peers about curriculum design and education in contexts where learners and teachers speak multiple languages, have complex cultural identities but share a passion for inclusive learning. Everyone involved in the DHE is keen to learn about and harness the potential for blended learning that, mirroring the vision for all UNAM students, will be enabled through the DHE and Co-Mentoring Scheme learning communities. As the DHE progresses a request to set up a similar mentoring scheme for UNAM Module Leaders and Tutors has been agreed. Implementation is already underway, supported by Cardiff’s Senior HEA Fellow group, and will be informed by an autumn evaluation of the mentor: participant scheme. If you are interested in hearing more about the co-mentoring scheme or would like to contribute when the second DHE cohort runs in 2017, please get in touch (Clare Kell: pcutl@cardiff.ac.uk).